For the past few weeks I have been working on a little EPP (English Paper Piecing Project) with Melody Miller's beautiful Picnic line. 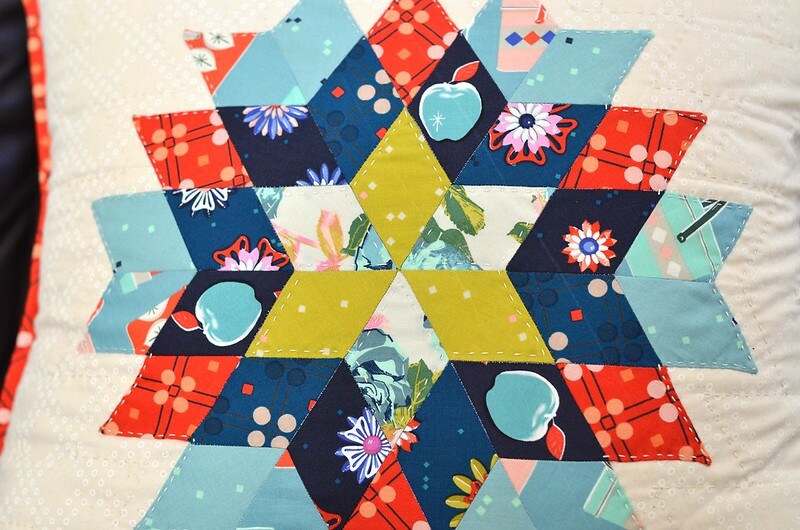 The Fat Quarter Shop has a great kit that has everything you need to get started with EPPing, as well as a kit that also includes fabric for this project. I have very limited EPP experience and found the kit very useful. This was also my first time glue basting my shapes and it was so quick and easy. To be honest I wanted to use all of the apple prints and I ended up spending entirely too much time trying to figure out an arrangement that used all of them. But I will have to save the other apple color ways for another project, because this was the layout that I eventually decided on. While I don't think that any EPP projects are quick, this one was a nice length. My skills are not awesome, but they are better than they were when I started. Since I spent all of that time hand sewing the pieces together it seemed wrong to do the quilting by machine. The hand quilting is pretty simple. 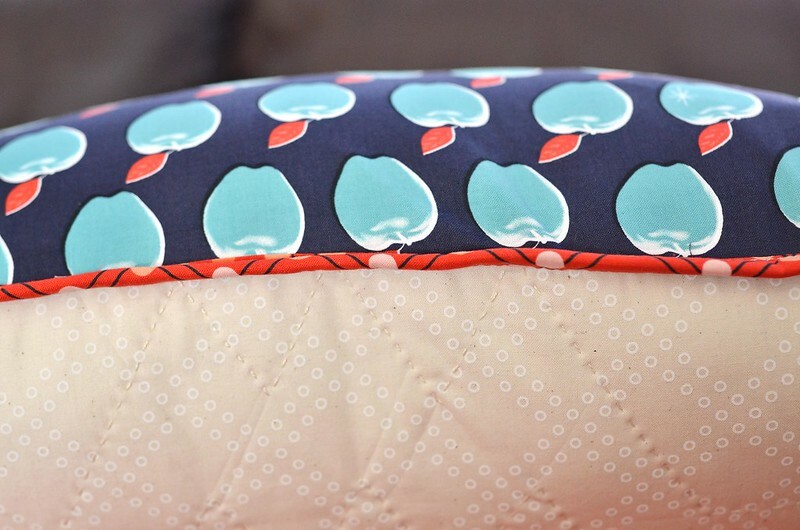 The original EPP Sew Along was intended to produce a mini quilt, but I decided to turn mine into a pillow cover. 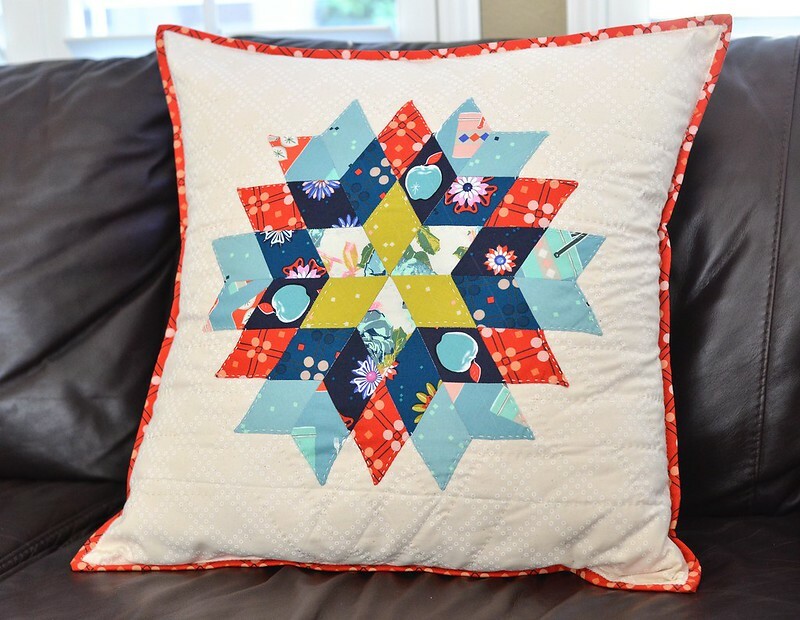 If you would like to make one of your own, you can find step by step instructions on the Fat Quarter Shop's Instagram account. The fabric I used it available here. You did a fantastic job!! Your pillow looks fabulous!! And where machine quilting can look gorgeous and perfect, there is something very special about hand quilting. It's like it just deserves respect and honor for some reason. Keep up your great work! Erica, I absolutely LOVE this! Beautiful work!! I can't find the tutorial! Could you post a more specific link? I love this and want to try and make it. Thanks! Love this, great fussy cutting the apples. The red binding really looks good.